In my post on smartphone segmentation by usage, I had hypothesized that the smartphone market was segmenting around use cases rather than price points. Smartphones with larger screen sizes (or phablets) were a better fit for use cases focused on pocketable computing, while devices with smaller screens were better suited for communication use cases. 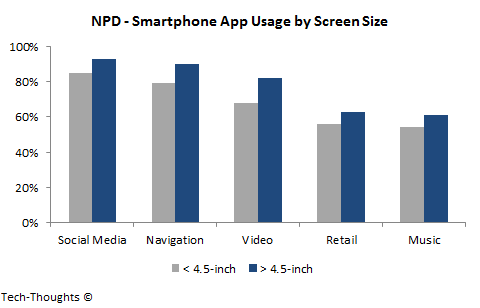 NPD's research on data/app usage by screen size seems to confirm my hypothesis. 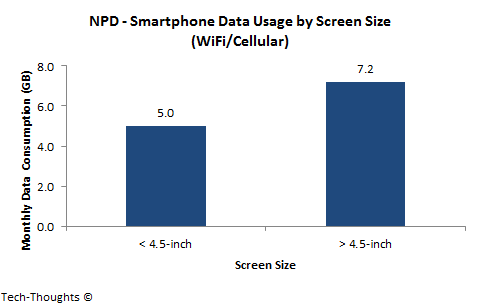 The chart above shows monthly WiFi and cellular data consumption on smartphones with screen sizes above and below 4.5 inches. NPD collected this data over a 3 month period (from May to July 2013) from a sample of 4,500 US-based Android and iPhone users. This is a key point, because the US is the iPhone's strongest market by far. The data clearly shows that owners of 4.5"+ smartphones used 44% more data than owners of iPhones and other <4.5" devices. The pattern of data usage on large screen vs. small screen devices seems to be surprisingly uniform across app categories like social media, navigation, video, retail and music. This seems to support my hypothesis that large screen phones and "phablets" are better suited for tasks related to pocketable computing. This data may also support the hypothesis that the iPhone is more about identity than utility. This means that the iPhone's best customers are likely to remain loyal (a fact that many analysts focus on), but less valuable customers are more difficult to understand. We will need a deeper understanding of the iPhone's current and potential user base to substantiate this further.